"Social media marketing is an engagement with online communities to generate exposure, opportunity and sales," says report author Michael A. Stelzner, founder of WhitePaperSource, "and the real shocker is that experienced folks are investing more than 20 hours each week with social media." Businesses of all sizes are leaping into the social media pool—and many are well-known brands. Computer giant Dell recently reported a million dollars in sales by issuing coupons on Twitter. Even Ford is using social media to interact directly with its customers. "Social media has helped Ford quickly achieve its goal of being a top social brand and has broken down the more conservative communications processes that were in place," said Scott Monty, head of social media for Ford. However, for most marketing pros, social media marketing is a fresh new phenomenon—and it's not just for the young professional. Among the 880 marketers surveyed, 72 percent have been at it for only a few months, and the median age was 40 to 49. "This is a story nobody else is telling," explains Stelzner. "Most marketers know the future is social media, but they aren’t sure how their competitors are playing the game." The big questions marketers most want answered about social media are also revealed in the report. Knowing where to start and if there is real money to be made were among the top questions pros want answered. 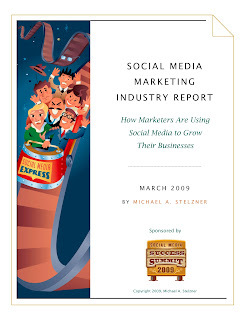 The report's sponsor, Social Media Success Summit 2009, promises to provide answers to many of the lingering social media questions marketers face. A complimentary class on social media is available for immediate download here.